...write about the personal and housing adaptations that may be required in order for seniors to remain in their homes for as long as possible. Aging Safely in Your Home provides a guided self-evaluation of the physical, mental, and social aspects of health and wellness that need to be attained. It also addresses modifications and renovations that must be taken into account to ensure safety and prevent falls. Why write about Aging Safely? So many people approached us who were seniors or who had elderly parents that wanted to stay in their homes throughout their final years. Gord is a building technologist and had done many renovations to the homes of elderly friends and family. I'd been treating senior clients for years and advising them on healthy aging practices. It became clear to us there was a need for a guide that encompassed the personal and housing aspects of aging safely at home. This book is written for the overwhelming majority of seniors who wish to maintain their independence and autonomy in their golden years. Unfortunately, many seniors seem to believe that without making any changes they’ll be able to remain at home until their final days…. but this is seldom the case. The natural aging process can bring on the kinds of decline that force seniors to relocate even when they’re not ready to. This book provides checklists that help seniors assess their health and wellness as well as their housing suitability. Helpful suggestions are offered to improve categories that are lacking or unsatisfactory. Aging Safely in Your Home is also written for the adult children of seniors who want their parents to be safe and secure. It can be used as a tool for discussions regarding the various factors involved in remaining in-place. Where can I get a copy of the book? 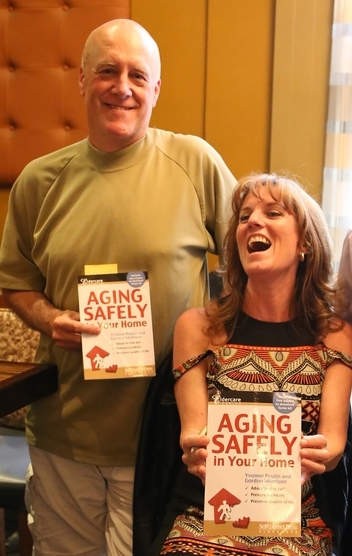 Aging Safely in Your Home was published by Self-Counsel Press in 2015. It can be purchase through Amazon and can be found in certain locations of Pharmasave, Chapters bookstores, Black Bond Books, and possibly even in your local library. What are people saying about Aging Safely in Your Home? We want to empower seniors to make healthy, informed choices that will affect how and where they live as they get older. We also want to see loved one’s involved in the assessment and encouragement of their senior staying safely at home for as long as possible. We’d like to see a decrease in the number of seniors in the hospital due to avoidable falls or injuries in the home or other conditions brought on by social and mental isolation. We truly believe that if our readers can make the personal and housing adaptations we recommend in this book, that they WILL be able to age safely in their homes.